In this issue of JCI Insight, Roy et al. report protection against a lethal dose of ricin in rhesus macaques following treatment with a humanized monoclonal antibody against an immunodominant epitope on ricin’s enzymatic A chain. 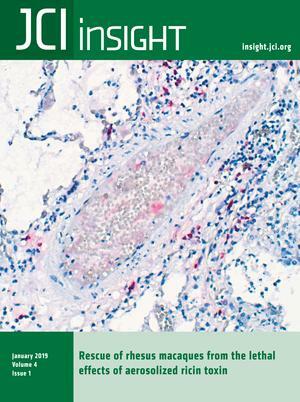 The cover image shows lung tissue from a ricin-treated animal, with infiltrating eosinophils stained with eosinophil major basic protein antibody (crimson). Citation Information: JCI Insight. 2019;4(1):e122163. https://doi.org/10.1172/jci.insight.122163. Pulmonary fibrosis (PF) is an intractable disorder with a poor prognosis. Although lung fibroblasts play a central role in PF, the key regulatory molecules involved in this process remain unknown. To address this issue, we performed a time-course transcriptome analysis on lung fibroblasts of bleomycin- and silica-treated murine lungs. We found gene modules whose expression kinetics were associated with the progression of PF and human idiopathic PF (IPF). Upstream analysis of a transcriptome network helped in identifying 55 hub transcription factors that were highly connected with PF-associated gene modules. Of these hubs, the expression of Srebf1 decreased in line with progression of PF and human IPF, suggesting its suppressive role in fibroblast activation. Consistently, adoptive transfer and genetic modification studies revealed that the hub transcription factor SREBP-1c suppressed PF-associated gene expression changes in lung fibroblasts and PF pathology in vivo. Moreover, therapeutic pharmacological activation of LXR, an SREBP-1c activator, suppressed the Srebf1-dependent activation of fibroblasts and progression of PF. Thus, SREBP-1c acts as a protective hub of lung fibroblast activation in PF. Collectively, the findings of the current study may prove to be valuable in the development of effective therapeutic strategies for PF. Citation Information: JCI Insight. 2019;4(1):e122933. https://doi.org/10.1172/jci.insight.122933. Medulloblastoma (MB) is the most prevalent malignant brain tumor in children, accounting for 20% of all childhood brain tumors. The molecular profiling of MB into 4 major subgroups (WNT, SHH, Grp3, and Grp4) emphasizes the heterogeneity of MB and opens paths in which treatments may be targeted to molecularly aggressive and distinct tumors. Current therapeutic strategies for Group 3 MB are challenging and can be accompanied by long-term side effects from treatment. The involvement of altered epigenetic machinery in neoplastic transformation in MB has become more evident. Thus, we performed an epigenomic RNAi and chemical screen and identified SETD8/PRE-SET7/KMT5a as a critical player in maintaining proliferation and cell survival of MB cells. We have found that inhibition of SETD8 effects the migration/invasive ability of MB cells. SETD8 alters H4K20me chromatin occupancy at key genes involved in tumor invasiveness and pluripotency. Interestingly, these results link the aggressive and metastatic behavior of MYC-driven MB with SETD8 activity. Based on our results, we suggest that SETD8 has a critical role mediating Group 3 MB tumorigenesis. Establishing a role for SETD8 as a factor in MYC-driven MB has potential to lead to more effective therapies needed to improve outcomes in high-risk patients. Citation Information: JCI Insight. 2019;4(1):e123431. https://doi.org/10.1172/jci.insight.123431. Deposition of amyloid-β protein (Aβ) to form neuritic plaques is the characteristic neuropathology of Alzheimer’s disease (AD). Aβ is generated from amyloid precursor protein (APP) by β- and γ-secretase cleavages. BACE1 is the β-secretase and its inhibition induces severe side effects, whereas its homolog BACE2 normally suppresses Aβ by cleaving APP/Aβ at the θ-site (Phe20) within the Aβ domain. Here, we report that BACE2 also processes APP at the β site, and the juxtamembrane helix (JH) of APP inhibits its β-secretase activity, enabling BACE2 to cleave nascent APP and aggravate AD symptoms. JH-disrupting mutations and clusterin binding to JH triggered BACE2-mediated β-cleavage. Both BACE2 and clusterin were elevated in aged mouse brains, and enhanced β-cleavage during aging. Therefore, BACE2 contributes to AD pathogenesis as a conditional β-secretase and could be a preventive and therapeutic target for AD without the side effects of BACE1 inhibition. Citation Information: JCI Insight. 2019;4(1):e124002. https://doi.org/10.1172/jci.insight.124002. To address challenges in the diagnosis of cognitive dysfunction (CD) related to systemic lupus erythematosus–associated (SLE-associated) autoimmune mechanisms rather than confounding factors, we employed an integrated approach, using resting-state functional (FDG-PET) and structural (diffusion tensor imaging [DTI]) neuroimaging techniques and cognitive testing, in adult SLE patients with quiescent disease and no history of neuropsychiatric illness. We identified resting hypermetabolism in the sensorimotor cortex, occipital lobe, and temporal lobe of SLE subjects, in addition to validation of previously published resting hypermetabolism in the hippocampus, orbitofrontal cortex, and putamen/GP/thalamus. Regional hypermetabolism demonstrated abnormal interregional metabolic correlations, associated with impaired cognitive performance, and was stable over 15 months. DTI analyses demonstrated 4 clusters of decreased microstructural integrity in white matter tracts adjacent to hypermetabolic regions and significantly diminished connecting tracts in SLE subjects. Decreased microstructural integrity in the parahippocampal gyrus correlated with impaired spatial memory and increased serum titers of DNRAb, a neurotoxic autoantibody associated with neuropsychiatric lupus. These findings of regional hypermetabolism, associated with decreased microstructural integrity and poor cognitive performance and not associated with disease duration, disease activity, medications, or comorbid disease, suggest that this is a reproducible, stable marker for SLE-associated CD that may be may be used for early disease detection and to discriminate between groups, evaluate response to treatment strategies, or assess disease progression. Citation Information: JCI Insight. 2019;4(1):e124370. https://doi.org/10.1172/jci.insight.124370. Host-commensal interactions are critical for the generation of robust inflammatory responses, yet the mechanisms leading to this effect remain poorly understood. Using a murine model of cytokine storm, we identified that host microbiota are required to sustain systemic TLR-driven immune responses. Mice treated with broad-spectrum antibiotics or raised in germ-free conditions responded normally to an initial TLR signal but failed to sustain production of proinflammatory cytokines following administration of repeated TLR signals in vivo. Mechanistically, host microbiota primed JAK signaling in myeloid progenitors to promote TLR-enhanced myelopoiesis, which is required for the accumulation of TLR-responsive monocytes. In the absence of TLR-enhanced monocytopoiesis, antibiotic-treated mice lost their ability to respond to repeated TLR stimuli and were protected from cytokine storm–induced immunopathology. These data reveal priming of TLR-enhanced myelopoiesis as a microbiota-dependent mechanism that regulates systemic inflammatory responses and highlight a role for host commensals in the pathogenesis of cytokine storm syndromes.